For more than a year now, my process of sharing student work involves me going around the class, snapping pictures on my phone, and uploading the results through a web page to my laptop. It's a lot smoother than using a document camera, and also enables students themselves to upload pictures of their work if they want, or if I ask them to. This is much smoother and faster than using a native application in iOS or Android because it's accessed through a web page, and is hosted locally on my laptop in the classroom. Unzip the file somewhere convenient on your computer, and make a note of where this is on your computer. You need to have a Python compiler installed for this to run, so make sure you get that downloaded and running first. If you have a Mac, you already have it on your computer. Edit the submit.py file in the directory containing the uncompressed files using a text editor. Change the address in the line with HOST to match the IP address of your computer. You can obtain this in Network Preferences. Change the root_path line to match the directory containing the uncompressed files. In the zip file, the line refers to where I have these files on my own computer. These files are located in the /Users/weinbergmath/Sites/submitMePortable directory. This needs to be the absolute address on your file system. Run the submit.py file using Python. If you are on a Mac, you can do this by opening a terminal using Spotlight, going to the directory containing these files, and typing python submit.py . Depending on your fire-wall settings, you might need to select 'Allow' if a window pops up asking for permission for the Python application. In a web browser, enter the IP address you typed in Step 2 together, port 9000. (Example: http://192.168.0.172:9000). This is how students will access the page on their computers, phones, or tablets. Anyone on the same WiFi network should be able to access the page. That should be it. As students upload images, they will be located in the /images directory where you unzipped the files. You can browse these using Finder or the File Browser. I paste these into my class notes for use and discussion with students. Let me know if you need any help making this work for you. If needed, I can throw together a screen cast at some point to make it more obvious how to set this up. My treatment of linear functions in the past has been pretty traditional. Solve for y, y = mx + b, graphing using slope intercept, then move on to linear inequalities in two variables...it is just dull this way. Most students have seen it before in one form or another, and it wasn't exciting (or that novel) to them the first time they learned it. It doesn't have to be this way, and I committed myself this year to doing things differently. Linear functions have a constant rate of change. All of the other qualities they have are related to this important fact. There is an amazing connection between graphs, tables of values, and the equations that generate linear functions. These are not three separate skills, they are three views of the same fundamental mathematical object. Corollary: Teaching them on three separate days or sticking to one view at a time creates an unnecessary pigeon-holing effect that sticks with students for as long as conditions in your class permit. On day one, we did my Robot Tracking activity posted here at GeogebraTube. The video introduction was reviewed in class and students worked on it for much of the period. This emphasized a fundamental concept around linear functions of distance and time that was pretty intuitive to nearly all of the students that did this activity. Predicting where something is located, assuming it continues moving at a constant rate is one of the most common applications of linearity. We do it all the time. Can we cross the street in front of the bus? Mental calculation. Where should I kick the soccer ball to get it right in front of the forward moving toward the goal? Mental calculation. I don't mean actually sitting down and calculating where it will be, but that the human brain is pretty good at noticing the velocity of objects, and making a pretty good guess of where it will be. They had a number of methods of coming to an answer that ranged from geometric (simply drawing a line) to counting grid squares, using the trace function, and proportional reasoning. We ended the period looking at the Python script I posted here and trying to calculate speed from the information generated by the program. Part of the homework assignment for the next class was to try to answer the question posed by another Python program posted here. The table of values is randomly determined each time, and students could (and often did) try it multiple times to get it right. The next lesson had a single instance of this program as a warm up for the whole class - everyone had to agree on what value of position I needed to enter for the given time value.. They were pretty good at checking each other and having good conversations about how to go about it. They answered correctly, but we had a good conversation about the different ways to get there. They all centered on using the fact that there was equal spacing between all of the points. Most students used some variation of finding the distance moved per second and whether it was positive or negative, and then counted off intervals. In most cases, it was a bit complicated and required a lot of accounting to get to their answer. We went over the reason we could do this - the constant rate of change - and verified it using a few different pairs of points. I then threw in the idea of using the point (x,y) and using the constant rate of change with that point. We got to and I asked them to write this using the slope we calculated and any point they liked from the table of data. Students seated next to each other I encouraged to use different points. I then asked them to answer the original question from the Python program using their equation. (Un)surprisingly enough, they all ended up with the correct (and same) answer as before. Some of them started distributing and writing in slope intercept form. THe thing I was kind of excited about was that they didn't feel the equation had to be written that way, they just felt like seeing what happened. Many discovered the fact that their answers were the same after doing so, even though they started with different points. We did a couple examples of solving more basic 'Write an equation for a line that..." questions, but did so without making a huge deal out of slope-intercept form or point-slope form and why one might be better than the other in different situations. The goal here was to constantly push the students to go back and forth between the equation and numerical representations of these functions. There were lots of good things students figured out from these. We then made the jump to looking at how the graph is connected to the table and equation - just one more way of looking at the same mathematical function, and it shares the meaning that comes with the other two representations: a constant rate of change. The new idea introduced as part of this was that of an intercept. What does it mean on the graph? What does it mean for the table? We didn't talk explicitly about the intercept's meaning of the equation (again, trying to avoid the "that's just y = mx + b, I know this already...TUNED OUT") , but it came out in the process of identifying it algebraically, from tables, and then graphing. By the end of the period, we were graphing linear functions. Students were asking excellent questions about when the intercepts alone can be used to graph the line, when they can't ( versus ) but they again stuck to the idea of finding a point they know is on the graph, and then using the constant rate of change to find others. Instead of spending a boring lesson explicitly telling them what my expectations are for graphing lines (labeled and scaled axes, line going all the way across the extent of the axes, arrows on axes and lines) I was able to gently nudge students to do this while they worked. We'll see how things go as we continue to move forward. The big thing I like about this progression so far is that modeling real phenomena will be a natural extension of what we've already done - not a lesson at the end of contrived examples with clean numbers. My goal originally was to get this group comfortable with messy data and being comfortable with using different tools to make sense of it. I've kept my students hermetically sealed from this messiness in the past - integer coefficients, integer values, and explicit step-by-step ways of graphing, generating tables, and writing equations. As I mentioned before, it was, well, boring and predictable, and perpetuated the idea that these skills are all separated from each other. It also continued the pattern that there would be a day in each unit where the numbers are messy, the real world word problems day, but that the pain associated with it would last a day and would be over soon enough. I'm hoping to reduce this effect by changing my approach. That by seeing the different aspects of linear functions, it will seem natural to use a graph to figure out something that might not make sense algebraically, or use numerical values to solve an algebraic problem. 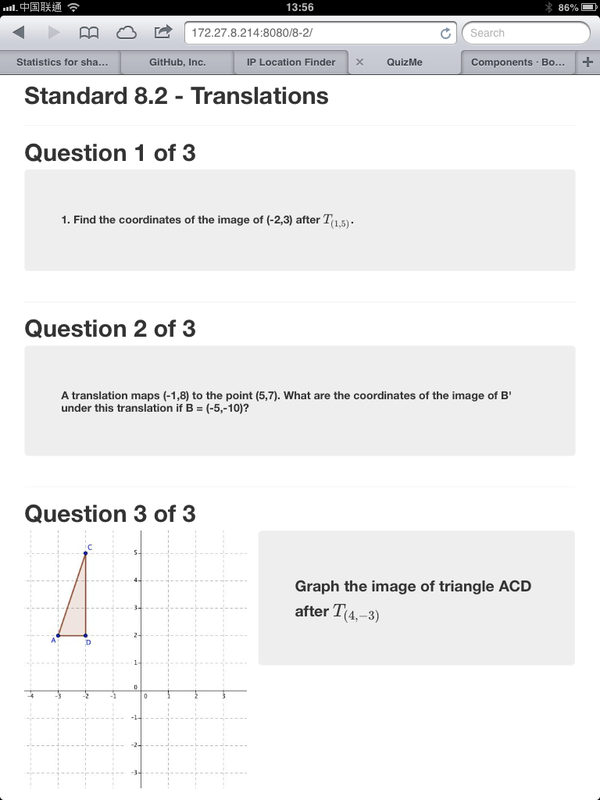 I especially like this because exploring the three views of functions really is, in my opinion, the primary learning goal of the Algebra 2 course. If I can establish this as an expectation early on, I think the latter parts of the course will work much more smoothly. Two stories to share after this week's activities with students about programming. I have posted previously about my interest in making Python a fundamental part of my classes this year, and so I am finding ways to include it when it makes sense to do so. I have a couple of students that are bridging the gap between Algebra 2 and Precalculus with an independent study that I get to design. The tentative title of the course for their transcript is 'Fundamentals of Mathematical Thinking' and the overall goal is to get these students a chance to develop their fundamental skills to be successful in later classes. I see it as an opportunity to really dig in to some cool mathematical ideas and get them to, well, dig into the fundamentals of mathematical thinking. I don't plan too much emphasis on the algorithms (though we will spend some time working on skills in algebra, polynomial manipulation, functions, and other crucial topics where they are weak). Looking at a situation, exploring the way different variables might be used to model that situation, and then really digging in to abstract the variables into a model. We are starting with what I think is the most fundamental application of this: sequences and series. Even simpler, the first task I gave the students was to look at the number of bricks in the rows of a triangular tower and use Python to add up the bricks in each row. This started as a couple of exercises getting to know Python's syntax. They are then taking programs I wrote to model this problem and adjusting them to find other sums, including the sum of even and odd numbers. One student that completed this task was intrigued that the sum of the latter consisted of perfect squares, but we didn't explore it any further at this point. I then gave this student a bunch of sequences. His task was simple: model each one in Python and generate the given terms. This is a standard exercise for Algebra & Precalc students by hand, but I figured that if he could do this with Python, clearly he was able to figure out the pattern. I showed him how to write fractions using string concatenation (e.g. 1/3 = 1 + "/" + 3) which enabled him to develop the harmonic series. Today he figured out Fibonacci and a couple other new ones. It was really fascinating to see him mess around think deeply about the patterns associated with each one. I did tap him slightly in the right direction with Fibonacci, but I have otherwise been hands off. I am also having him write about his work to give him opportunities to work on his writing too. When he feels comfortable sharing it (and I have already warned him that this is the plan), I will post links to his work here. The other new thing was in Calculus. I have shortened my review of Pre-Calculus concepts substantially, and have made the first unit a survey of limits, rate of change, and definite integrals. Most of this has required technology to explore local linearity and difference quotients. On Thursday, I introduced using rectangular sums to find area - they were otherwise stuck on counting boxes, and I could tell they felt it was like baby math. They really didn't know any other way. In showing them rectangular sums, we had some pretty good discussions about overestimating and underestimating. The students had conversations about how rough the approximation with only 3 - 5 rectangles gave for area under a parabola. A couple of them figured out how to use more rectangles. I told them I was going to write a program to do this while they were sitting and working. I created this program and talked them through how it works. They thought it was too complicated to be worth the time, but I think they did understand the basic idea. I then changed the value of N and asked them what they thought that meant. They got it right the first time. I then pushed the value to higher and higher values of N and they immediately saw that it was approaching a limit. Game, set, match. Today I had the AP students together working on another definite integral activity that focused on the trapezoidal rule. I showed them the code again and gave them the line that calculates area. It wasn't too much of a stretch for them to work their way to adjusting the program to work for the Trapezoidal rule. We ran out of time to discuss comparisons between the two programs, but they stayed late after class and into their lunch getting it working on their own computers and playing a bit. Here is what we came up with. The big battle I see is two-fold. Help students not be intimidated by the idea of writing a program to do repetitive calculations. Give students opportunities to see it as necessary and productive to use a computer to solve a problem. Sometimes these battles are the same, other times they are different. By using the built-in version of Python on their Macs, I have already started seeing them run commands and use text editors to create scripts without too much trouble. That's the first battle. My plan is to give lots of examples supporting the second one in the beginning, and slowly push the burden of writing these programs on to the students as time goes by and they become more comfortable with the idea. So far I am feeling pretty good about it - stay tuned.